After months of cold, gray days, New Englanders have certainly earned their warm, sunny, spring and summer days spent outdoors. Winter’s snow, water, and wind can take it’s toll, so if you’re planning on making the most of the warmer weather by clocking in some time on your patio or deck, take the time to assure your structure is safe and sound. 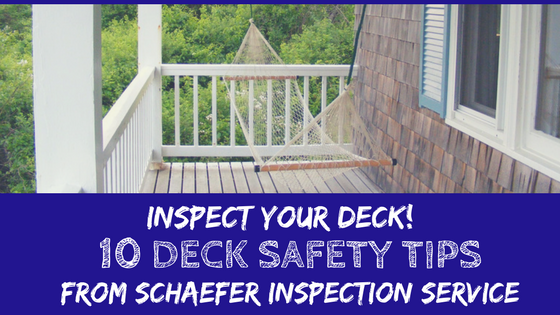 May is Deck Safety Month and the perfect time to check for any damage or deterioration. Here are 10 tips from our expert inspectors to ensure your deck is ready for your outdoor parties, barbecues, and relaxation sessions. 1. Make sure your deck isn’t pulling away from the house. If you do see any gaps between your house and deck, seek immediate attention from one of our inspectors or qualified contractor. 2. No tilting! Soil changes, weathering, and other circumstances could cause your deck to become un-level. If you place a skateboard at one end and give it a little push, it shouldn’t slide to the other end on it’s own. If things seem off, call us for an inspection. We’ll give your entire home, including your deck, a thorough look. 3. If water has seeped into the wood over a long period of time, it’s more susceptible to splinters. Check your boards for cracking and slivering— you may need to reseal the wood. Here are some more tips on how to repair a splintering deck. 4. Look out below! Take a peek underneath your deck and check the support system to ensure the beams below the structure are straight, secure, and won’t give way once your friends arrive for the first BBQ of the season. 5. Clean off leaves and other weather buildup. This isn’t just for aesthetic reasons, but you could easily slip on debris. Use a power washer to get rid of moss or other wet, stuck on plant life, and finish off the job with a mildew remover. Make sure you test the mildew cleaner on one area first to guard against staining. 6. Check your railings. A light lean against your deck’s railing shouldn’t cause it to crumble. Railings should be secure with ballasts not more than four inches apart— you don’t want any little ones falling through! 7. Inspect the creature comforts. Are the deck lights working? What about the electrical outlets? How did your outdoor furniture hold up and what might need replacing? It’s always important to be safe, but it’s also important to have a space that brings you happiness. 8. SPEAKing of creature comforts, here’s one quick and inexpensive improvement you can make for you deck: these outdoor bluetooth speakers are waterproof, shock proof, dust proof and at only $22 bucks, you can’t pass up all they will add to your outdoor experiences! 9. Get ready to grill! Before you throw on that first steak of the spring, make sure your barbecue grill is clean, safe, and working properly. Here are four things you should do to prepare your grill for the season. And when you’re ready to start smoking, here are more than 100 incredible recipes perfect for cooking outdoors. 10. Inspect your spirits. Have your summer cocktail supplies dwindled? Stock up! After all, you’ll need something to wash down all that BBQ. These 28 refreshing summer cocktails are sure to please all parties! If you think your deck could use some safety assurance, give us a call! Our full home inspection will give you and your family peace of mind that your deck, patio, porch, and all other areas of your home, are secure and safe. If you have any other questions regarding decks or home inspections or would like to schedule an appointment with us, give us a call at 1-800-345-2776. You can also reach out to us on our Facebook page here or tweet us @SchaeferInspect.